It’s a fact that no IT company can guarantee 100% uptime by protecting against every possible threat scenario. However, Syntec Systems has assembled a comprehensive plan to minimize the risk and exposure to your business and maintains an emergency response preparedness plan in the event a critical failure does occur. Whether your network goes down during normal business hours or in the middle of the night when least expected, response time becomes paramount. Partnering with Syntec Systems gives you piece-of-mind that we will be aware of any significant issues or problematic devices before you know a problem exists. We will be in direct communication with you and working alongside you until the problem is resolved. Are you currently experiencing an IT Emergency? Get in touch with our 24/7 Helpdesk now! Firstly, don’t panic. 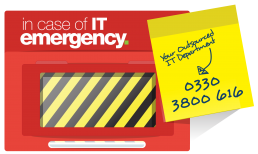 If you are currently undergoing an IT Emergency we know it can be a stressful experience for any business owner, but you are in the right place. Get in touch with one of our team by phone on 01536 216146, or submit an urgent support request using the form on this page. Sudden and critical network failures are an ongoing threat to almost every business. One day your systems can be functioning perfectly, and seemingly with no explanation you can experience a partial or complete failure of your infrastructure. Whether you’ve been hit by a companywide Cryptolocker or RansomWare attack, or something as straightforward as a single-user hardware failure, IT Emergencies come in all shapes and sizes and we appreciate that regardless of size, any IT Emergency can cause damage to your business. IT emergency cover - no prior contact required! Whilst we always advise our clients to adopt the time old phrase; prevention is better than cure, sometimes until an IT Emergency has struck, establishing an IT Support contract might not have been one of your priorities. We understand that, and that is why we offer our IT Emergency cover to all businesses, regardless of whether we have worked with you before or not; no support contract necessary – Just get in touch with one of our team today.